A new survey of data science tools shows that Python usage is quickly gaining steam among advance analytic professionals, at the expense of both R and SAS. 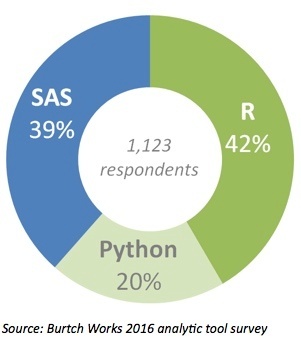 According to the results of the 2016 survey, conducted by Burtch Works, R is the preferred tool for 42% of analytics professionals, followed by SAS at 39% and Python at 20%. While Python’s placing may at first appear to relegate the language to Bronze Medal status, it’s the delta here that really matters.